In my previous article, I explained how to mount and assembly the Anet A8. You are certainly looking forward to your first impression. Just to prevent your first object from looking like a big paté, or worse than you damage the heating plate, it is advisable to make some preliminary adjustments. That is the purpose of this guide. As you may have noticed, the A8’s printer bed is covered with masking tape. He’s not only here for protection, not just protection. It is especially there so that the molten plastic adheres correctly to the heated bed. It should not be removed. It also prevents warping (the deformation at cooling). We will see later on that this masking tape can be replaced by a higher temperature resistant (blue) masking tape or simply put a pane of glass on the heated bed. But all this we’ll see in the upgrades. Here the painter’s ribbon begins then it is top:). The first step is to level the Z axis and make sure that the extruder is at the right level with respect to the Z axis. The two “Z” axes must be at the same level. Then take your meter. And adjust each axis by hand (by turning the couplings of each Z-motor) so that it reaches the same level. Take as reference mark 20 / 21 cm. The Z-axis motors must always move together and keep this alignment, so once the adjustment is made, check it from time to time. Once this task has been performed, the limit switch of the Z axis must be adjusted, the one above the left “Z” motor. Lock it at the highest point. The printer will start moving (Wahouhhh), and position itself in X: 0, Y0 and Z0. The point of origin. The extruder will stabilize at about 2cm / 2.5cm from the heating plate. The Z-axis switch will then be retouched and lowered 1.8 to 2.3 cm (make sure that there is still 2 mm distance from the previous measurement). Once the switch is attached. Do it again. If you measure the distance between the extruder and the plate, it must be about 2mm (if it is 3/4, it’s not serious, we will be able to adjust). Move the extruder carriage and the heating tray to make sure that the extruder is in the left corner closest to you (not above the screw, but just beside it). You will unscrew the screw, this way the spring will relax and raise the heating plate. The purpose of the operation is to leave sufficient space for the passage of an A4 sheet. To control, take your sheet and pass it between the tray and extruder (always in the corner). 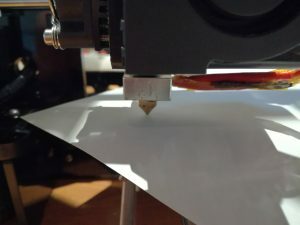 The extruder should lightly scratch the sheet without tearing it. If this is the case, it is because this corner is set correctly. Repeat the same operation on the other three corners. Once it’s over, we finished calibrating the bed. This is the most important setting you need to make. It really depends on the final quality of your future impressions. 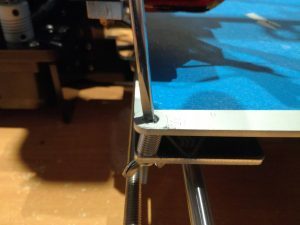 The bed leveling on the A8 must be done during the first focusing, about every 5 prints after that, and each time you move the printer or adjust it. In most cases, the process should only take 5 minutes (you’ve tweaked the biggest one), so don’t worry too much. If your impressions have problems or if the base layer doesn’t adhere properly to the bed – especially if the problem only seems to come from a part of the heated bed – then levelling the bed is most certainly the cause of the problem. With the levelled bed, you are ready to try your first 3D impression. Before you get started for good, you need to understand the different types of files accepted by the printer’s printer and how to generate them. A 3D print usually starts with a STL file. This type of file describes a 3D part generated from a CAD modeling program such as Sketchup, Blender, Solidworks, etc. This file type describes a 3D part generated from a CAD modeling program. These are also the types of files you download from online open source 3D printing sites such as Thingiverse, Yeggi and others. However, 3D printers do not have the ability to print a STL file directly. Although a printer may seem sophisticated, it is in fact only able to follow basic instructions of its kind. “Go to the left for 1 mm on the X-axis, push the filament, etc. The STL file must then be transformed into an instruction file that the printer will include. We’re talking about gcode files. Special software is needed to make the transformation. These are “Slicers” who will take over this intermediate step and convert STL files (download from the Internet) into gcode instructions that your printer needs to build the object you want to build. In this article I will tell you about Cura to do this work. It is open source and free, available for Windows, Linux and Apple. Here is my procedure to create my gcode file and print it. Turn on the printer, yes you should not forget it. While the printer is heating up, we’ll take advantage of this time to launch Cura and upload our files to the SD Card. 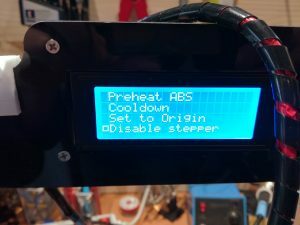 Adjust the temperature of your extruder and heating bed according to the instructions given by the filament manufacturer. set the print accuracy (the setting is at the top) to start Draft (0.2 mm) is sufficient quality. adjust the filling of your room. Usually 20% is enough to start with. Once all settings have been made, save the file to your SD card. 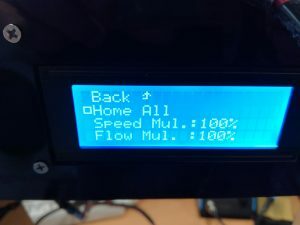 Once the extruder has reached maximum temperature, it is time to insert the filament (if it is not already there, you can leave the filament once the printing is finished /! \). It takes a little time before the plastic thread is well controlled. And at the beginning it’s a good kicking of the fingers:). Place your SD card on the printer’s electronic card and in the made menus: Mount SD Card. Then choose the file to print. The printer heats up again until it reaches the temperature you specified in CURA. All you have to do is watch the show. When printing is complete, take a small plaster spatula and remove the object from the tray. It is easier to remove the object when the tray is still a little hot I think. Once printing has begun, stay close to the printer to check that everything is going well. The first few minutes are crucial. Watch carefully and make sure that the first layer is properly placed on the bed and adheres well. If this is not the case, everything else will not stick and you will be wasting plastic. If all goes well, you can leave, otherwise stop printing (in the SD Card menu) and troubleshoot the printer (platform level to check first).